Turn your CRM, Marketing, Loan Origination and Core data into decision-quality reports, scorecards, dashboards and board-ready visual presentations with my Performance Navigator. No more pointing fingers. Everyone is sharing the same trusted data. Gain confidence knowing what questions to ask. Slice and dice your data down to the smallest detail. Combine and reconcile CRM, LOS, Marketing and CORE data. Justify your investments in technology, training, coaching, marketing and incentive compensation. Cascades from the frontline to the board room. 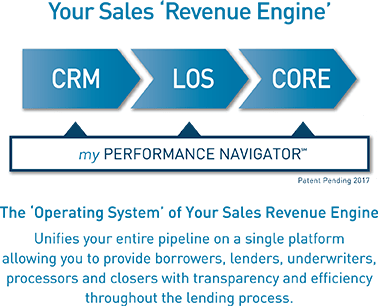 Performance Insights’ my Performance Navigator becomes the ‘operating system’ for your sales revenue engine. More accurate and reconciled data from your CRM, LOS and Core allow you to quickly spot trends, outliers and bottlenecks. Create a cadence of accountability that ultimately improves win rates and shortens sales cycles – increasing sales velocity. Understand everyone’s impact on sales from marketing, training, coaching, incentives and your underwriting SLA. Spend less time arguing about who is right and more time executing your sales strategy. Focus on what is really driving sales revenue and empower your sales managers to make data-informed decisions. Real transparency allows you to what is really happening – from lead to funding. Manage lead campaigns – from lead generation to the demand from lead creation to closed won. my Performance Navigator Eliminates All Your Spreadsheets and All The Wasted Resources to Create Them!